If you have never had carnitas at all, they are usually made of pork. But my smoky instant pot beef carnitas are every bit as lip-smacking and flavorful as their porky cousins. They are spicy, smoky, and very hard to stop eating. As a bonus, they are also Whole30-compliant. Enjoy! I’m proud to once again be partnering with the North Carolina Department of Agriculture & Consumer Services to bring you this sponsored post and round up. 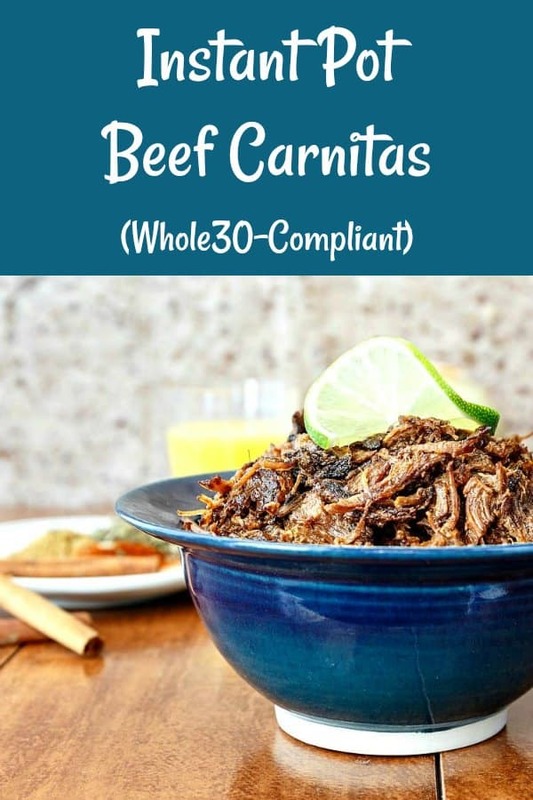 3.1 Are Carnitas Whole 30? 4 Are Beef Carnitas Keto? I am working with the North Carolina Department of Agriculture & Consumer Services to bring you profiles of beef-producing farms in North Carolina who sell their beef at non state-supported farmers’ markets. We are very fortunate here in NC to have so much variety and so many choices when it comes to purchasing meat, fruit, vegetables, and more from local vendors. Today, we are profiling 5 farms who are selling their beef in the Triangle area (Raleigh/Durham/Chapel Hill). I had the pleasure of meeting Bryan Horton from Fickle Creek Farm at the Western Wake Farmers’ Market on the first Saturday of the Spring market to hear about their meat and to buy some for today’s recipe. Here’s the video I shot, and afterwards, I’ll tell you some more fun facts about Fickle Creek Farm. In preparation for this post, I emailed with Noah Ranells, who has been with the farm since 1999. Between the questions I asked and information I found online, I have put together this list of fun facts about Fickle Creek Farm. What started off small with just a handful of animals has turned into a 215 acre operation producing beef, pork, lamb, chicken, eggs, and produce. Fickle Creek Farm uses Great Pyrenees dogs to guard their flocks and herds against predators. Their cattle graze on pesticide-free pastures. As mentioned in the video above, Fickle Creek is not certified “Grass-Fed,” but everything the cattle eat grows in the pasture. All the animals at the farm are rotationally grazed, which means they are moved from paddock to paddock within a pasture. This allows parts of the pasture to get a break from grazing, preventing overgrazing and also promoting optimal grass growth. Fickle Creek Farm participates in their local economy by taking care to purchase and sell close to home. For example, the most distant point of sale for the farm is only 35 miles, and they purchase all the livestock from within 50 miles of the farm. Fickle Creek Farm offers an apprenticeship program for aspiring farmers. There is an on-location AirBnB if you’d like to have a getaway on the farm. They offer farm tours on the first Sunday of each month. Find out more here. Now, here are my questions with responses from Noah Ranells. He was kind enough to take time during a very busy lambing season to answer my questions. Here are Noah’s responses to my questions. Parentheticals are mine. How long have you been in business? 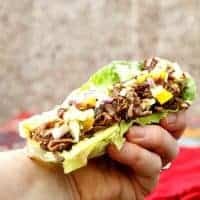 How/why did you get started raising beef? Did you start out offering meat and produce or only produce? What was the evolution of the farm and its offerings as they stand today? In business since 2002 on the main farm which was purchased in 1994. Spent lots of time as a youth on a farm with cattle and was in 4-h all my growing up years. Stated with Boer goats and Barred Plymouth Rock laying hens. then added raising calves and pigs for beef and pork. Switched to sheep and stopped raising goats. Then began breeding pork and beef. Now offer chicken ,pork, beef, lamb, turkey, eggs, and produce. Own 235. rent 45. Going forward, how do you foresee your growth/do you have plans to scale up? Short term goals of better connecting to current and future customers Longer term goal of transitioning farm to younger farm family to carry forward the tradition of sustainable farming. How do you raise your beef? Are you certified in any area/s? We raise our beef on forage based diet, grazing as much as we can and not out feeding concentrated feeds. We are Animal Welfare Approved for beef, pork, lamb, chicken, turkeys. We are Certified Grass Fed for beef and lamb by A Greener World. (They are in the process of certification for Grass-Fed status now). Can you tell me a bit more about nutrient cycling as it pertains to all your products (vegetables, meat, etc)? We rotate our chickens and broilers in pastures that will later grow forage for sheep and cattle. The nutrients that are in the feed that the chickens eat will provide benefits to the growing and laying flocks. What is not utilized and retained by the chickens is deposited on the pasture area by the chickens as manure. Since the chickens are free roaming in large paddocks, they spread their manure across the paddocks which helps for even availability of nutrients including nitrogen, phosphorous, and potassium to the encourage forage crop growth. Sometimes we will use cereal small grain rye as a cover crop to scavenge nutrients left by pigs or chickens, and when ground cover requires an additional seeding. Please tell me a bit about how permaculture plays a vital role in your business. We try to use the naturally occurring biological phenomena to benefit our farm enterprises while considering long term stewardship of of our natural resources including soil and water. What is your favorite way to prepare your beef? Seared steak, braised roasts, and of course, burgers!! We also do our share of crock pot roasts and stews for great hearty eating! What are the benefits of selling at farmers’ markets? There is nothing like talking directly to the customer about the products from our farm that they are purchasing. It is such a direct way for people to connect directly to our farm… and for us to provide information on how the product was grown, raised, and processed! Where else can we find your beef? We are at the Chapel Hill Farmers Market at University Place, the Durham Farmers Market at Central Park on Foster Street, and the Western Wake Farmers Market in Morrisville / Cary. We also sell directly from the farm on Wednesdays 11 to 1, Fridays 9 to 6, and Saturdays 2 to 4. For larger purchases over $100 we can set individual appointments. We can also arrange deliveries to work places interested in starting Community Supported Agriculture (CSA) programs or meat buying clubs. We can ship our beef salami, beef snack sticks, and beef jerky. How long have you been offering your meat/vegetable/egg/farm CSA? Approximately how many people subscribe to your CSA? How has this offering changed your business, if at all? The full farm CSA was first offered in 2009. Between 50 and 75 folks subscribe at any given time. We continue to work to improve our CSA and the value that it provides our customers. How long have you been running the AirBnB? How popular is it? We started offering farmstay accommodations in 2002 and find that it is popular with individuals, families with young children, grandparents with grandkids, retreat seekers, new residents waiting for their home to be finished, and families visiting local college campuses! Some folks just want to hear roosters crowing in the morning and have the freshest eggs they can get by collecting their own! You offer apprenticeships to aspiring farmers. Tell me more. Do you get folks who want to apprentice only in the produce arena, or do all apprentices participate in all farm activities, regardless of the type of farming they want to do? How long is an apprenticeship? The apprentice program is geared for young and aspiring farmers, as well as other folks interested in learning more about small sustainable farms and food production. Our farm offers the opportunity to learn about a variety of farm enterprises that includes both livestock and produce, as well as direct to consumer marketing. Apprentices get a chance to rotate through the different parts of the farm for 6 months to a year. What would you like my readers to know and appreciate about Fickle Creek Farms. What factor/s make Fickle Creek unique among NC farms? We try hard to farm traditionally where veggies, eggs, and meats are produced on an integrated crop and livestock farm. We continually try to improve our production of meat, poultry, eggs, and vegetables, always striving to be better stewards of our livestock and soil through crop We are also very transparent and offer monthly farm tours on the first Sunday of each month and annually each April so folks can see our farm and learn more about the farm fresh products we offer. Every time I speak with a local farmer or vendor at a farmers’ market, I am impressed by their dedication and passion. And always by their products. The beef from Fickle Creek Farm is no exception. I used a 3 pound chuck roast to make some pretty spectacular beef carnitas. There are a couple of really great things about these carnitas, you guys. Thing 1: they’re spicy. Lots of times, carnitas can be just a bit bland. This is okay if you’re going to add a lot of toppings, but sometimes you want the meat itself to be spicy. Thing 2: they’re moist and lip-smacking. Carnitas can be dry. Not these. I show you what to do to ensure they stay moist and perfect, even after 2-3 days in the fridge. Thing 3: these beef carnitas happen to be Whole30 compliant. That’s right. We’re doing Whole30 right now, and in order to eat what I made, I had to make sure the recipe follows the rules for Whole30. That is not to say you couldn’t add beans or cheese as a topping for your carnitas taco. I’m just saying that, when it comes out of the InstantPot, these guys are totally compliant. Keep them that way by serving them over cauliflower rice or in a lettuce wrap. And try some spicy taco sauce from my friends at Red Duck Foods. Both their mild and spicy taco sauces are Whole30 compliant. Which, if you have ever done Whole30, will make you shout hallelujah. By themselves, beef carnitas are not keto. This is because keto requires high fat, low carb and moderate protein. The carnitas by themselves are too high in protein to be considered keto. You could use them as part of a small part of a larger keto meal that also contains good fats. For example, you could top a few spoonfuls of carnitas with guacamole and serve it over cauliflower rice. Check your macros to make sure it’s still not too much protein. Remove from cooker and break up slightly. Reduce the juices. While the juices are reducing, brown the meat really well only on one side in a cast iron skillet. Stir the reduced juices back into the browned meat. While there are a fair number of steps in the Carnitas Procedure, none are difficult. All you need is your trusty InstantPot, but you can also make them in a Dutch oven. 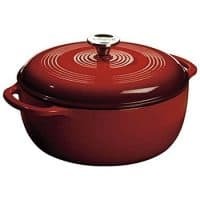 Once they come out of the pot, you’ll also need a large cast iron or other heavy skillet. Check it out. Before we get to the recipe, I want you guys to see the other dishes and farm profiles my fellow bloggers have been working on. Please take a visit! Four other bloggers. Four unique North Carolina farms producing beef. Four spectacular recipes. There really is no secret to keeping your carnitas moist. Use natural release for a good 30 minutes, reduce the liquids, and stir them back into your carnitas. So good. If you have just gotten (or are considering purchasing) an Instant Pot, it can be hard to know where to start. 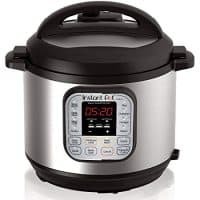 Here are some excellent resources for you to help you get started, as well as some Instant Pot Cookbooks I think you will get a lot out of. The chuck from Fickle Creek Farm worked really well in these carnitas, you guys. Often, grass-fed beef can be a bit dry because it is generally leaner than grain-fed beef. But like Bryan said, because of the rich diversity of food in the pastures, Fickle Creek’s meat isn’t quite as lean as other grass-fed beef. 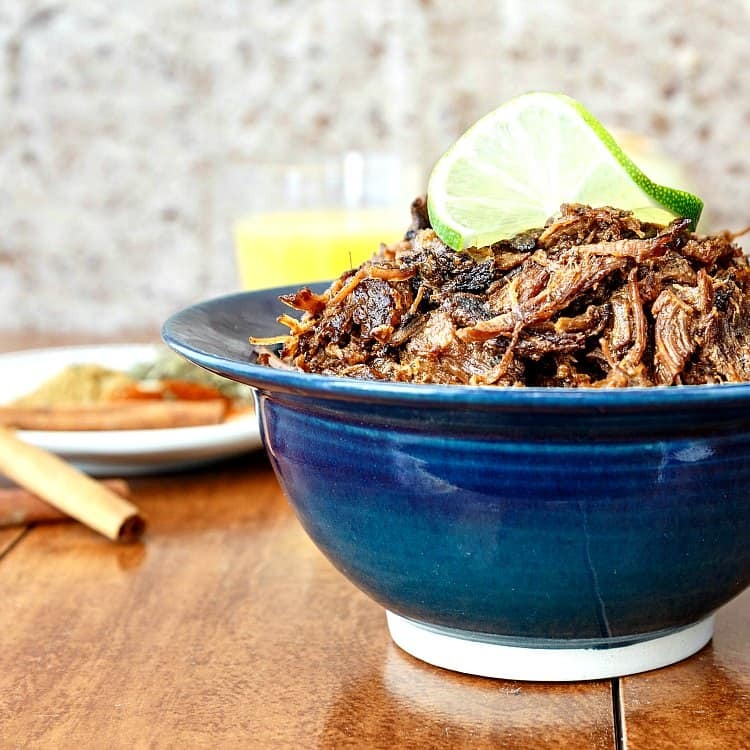 That, plus the technique of stirring back in the cooking juices keeps these Instant Pot beef carnitas moist and Succulent. They are So Good. And now, on with the recipe. Let’s make these carnitas, shall we? Generously season your cubed chuck roast with salt and pepper. Set your InstantPot or multi-cooker on the saute setting. Allow to heat for 5 minutes. Add the oil. Once the oil is hot, add the beef in batches so as not to crowd the pan. Brown well on one side, seasoning the other side with salt and pepper if you hadn't done so earlier. Turn the meat and brown the other side. Remove to a bowl or plate while you brown the rest of the meat. With the cooker still on saute, add the onions, garlic, chipotle powder, cumin, oregano and cinnamon sticks along with another heavy pinch of salt and freshly ground black pepper. Add the meat, along with any juices that accumulated in the bowl or plate, in an even layer. Top with the coconut cream, the juice and zest from the 2 oranges, and the stock. Put the lid on the InstantPot and choose the meat/stew setting--or 35 minutes at high pressure. Once the timer goes off, allow natural release for 30 minutes and then manually release the rest of the pressure. Remove the lid. Skim off most of the fat, and then remove the meat to a bowl. Discard the cinnamon sticks. Turn the InstantPot back onto saute and bring the cooking liquid to a boil. Allow to reduce while you continue with the next steps. Using 2 forks, break up each chunk of meat into 2 or three pieces. 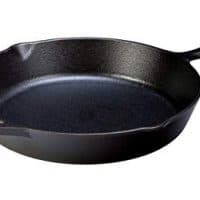 Heat a cast iron pan over medium-high heat, add the second amount of oil, and heat for a few seconds. Arrange all the pieces of meat in a single layer. I had just enough room to do 3 pounds of beef in my 12" skillet. If you are cooking more beef or have a smaller pan, you will need to do this in batches. Let the meat fry in the oil until very crisp and dark brown, but not charred. Check every minute or so to make sure you don't burn your carnitas! Once the meat is nice and crisp on one side, place it back in the bowl. Serve as taco meat, burrito filling, a topping for nachos, on a burger, or in any other way that sounds good to you. *** Enjoy! *You will have a fair amount of cooking liquid. To stir back into the meat, you'll want to reduce the liquid on the saute setting for about 10-15 minutes. When you scoop up the liquid, you'll also get bits of onion and garlic. Good stuff. Once you've used the cup of meat, you can reduce the remaining liquid until syrupy. Press through a fine mesh strainer and use it as taco sauce. You will not be sorry. **You can eat the carnitas immediately, but I think the flavor is better after having a rest in the fridge. And with the technique of stirring the cooking liquid back in as you shred the meat, you can be sure your carnitas will not be dry, even after a few days in the refrigerator. ***As pictured, I stuffed the carnitas into romaine leaves and then topped with red onion, sweet yellow pepper, a slaw made of cabbage with salt, vinegar, orange juice, lime juice, and cumin, and some of the reduced cooking liquid. 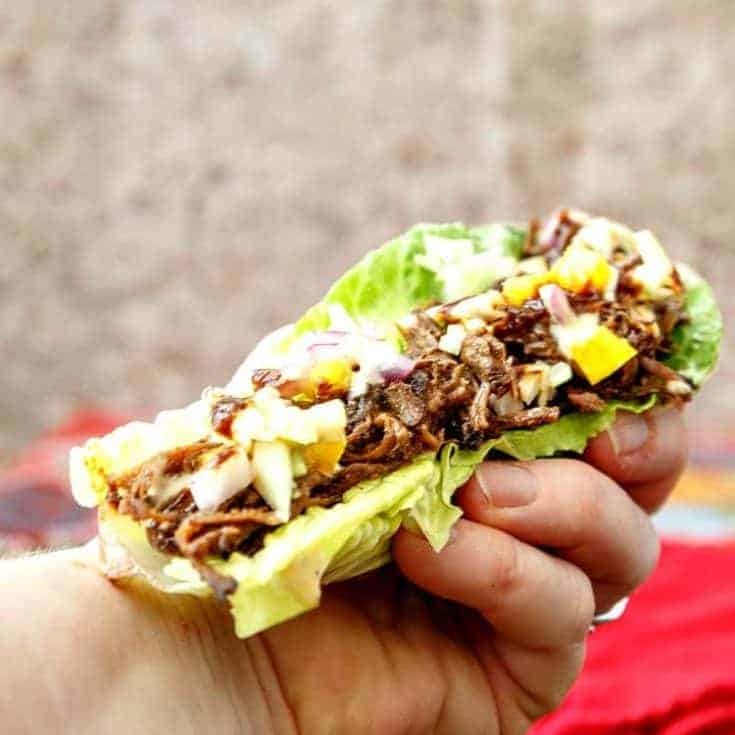 Serving suggestion: Whole30 InstantPot Smoky Beef Carnitas Lettuce Wraps! 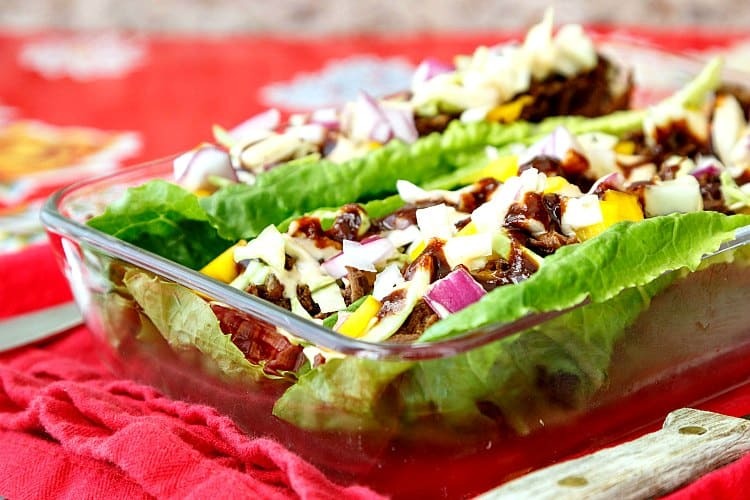 Keep your beef carnitas Whole30-compliant by serving them in lettuce wraps with red onion and sweet bell pepper. break up the meat and stir in the cooking liquid. Once you get the steps down, it will not feel so daunting. I promise. I hope I’ve convinced you how delicious these smoky beef carnitas are, whether or not you make them in an instapot, you really will want to make them. I’d like to thank Noah and Bryan from Fickle Creek Farm for their time and for their truly excellent beef. Thanks also to the North Carolina Department of Agriculture & Consumer Services for supporting small farms throughout North Carolina and for sponsoring this post. 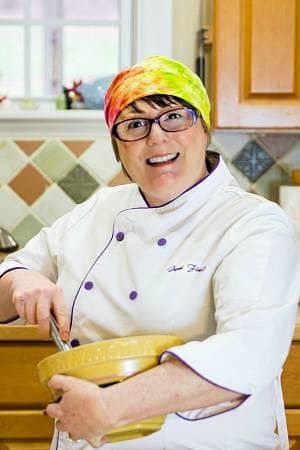 Thanks as well to my fellow bloggers for coming up with some really creative and mouth watering recipes using NC Beef. And thank you for spending some time with me today. 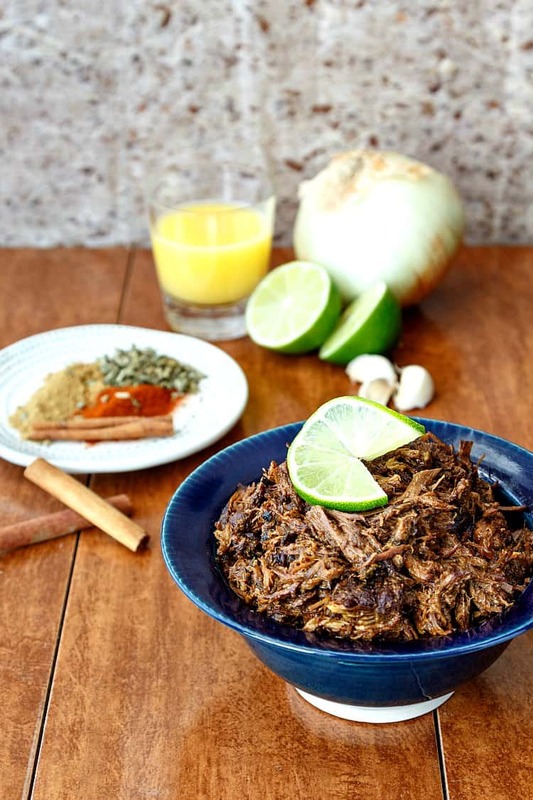 Enjoy the Instant Pot beef carnitas, take care, and have a lovely day. You can absolutely make them overnight in a Dutch oven in a 200F oven. That would be amazing! And they really are pretty darned good! Oh my, Fickle Creek Farm sounds awesome and I love that they have an AirBNB! How fun! love the carnitas too! Great Video! Thanks, Angie! I am so impressed with how many different meats and vegetables they sell. Can’t wait to try their chicken, pork and lamb. And make more carnitas! So good, Jack! And thank you for checking it out and for commenting! I hope you really enjoy them–I’m making more today! Oh, Sissy! These sound DIVINE! I must make these ASAP! You really, really must! You do not even want to know how little time it took for us to plow through 3 pounds! All I can say is maybe shoot for 5 pounds when you make them!